“Operation Unified Protector is one of the most successful in NATO’s history… We have done this together for the people of Libya, so they can take their future firmly and safely into their own hands. Libyans have now liberated their country. And they have transformed the region. This is their victory” – Former NATO Secretary General, Anders Fogh Rasmussen, speaking in October, 2011. “In Libya, the death of Muammar al-Qaddafi showed that our role in protecting the Libyan people, and helping them break free from a tyrant, was the right thing to do” – US President, Barack Obama, speakingin October, 2011. “I am proud to stand here on the soil of a free Tripoli and on behalf of the American people I congratulate Libya. This is Libya’s moment, this is Libya’s victory, the future belongs to you” – Former US Secretary of State and Democratic Candidate for President, Hillary Clinton, speaking in October, 2011. 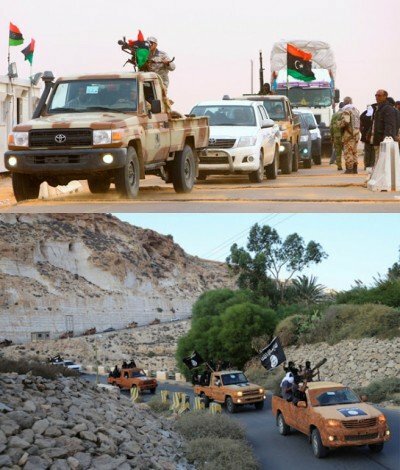 On August the 1st, US warplanes bombed Islamic State (IS/ISIS/ISIL) targets in the Libyan city of Sirte, almost exactly five years after Western imperialists declared NATO’s 2011 war in Libya a complete success. These strikes are not the first conducted by the US in Libya this year, in a broader campaign that is officially aimed at defeating an enemy that the US had a major hand in creating in the first place (I’m sure the military-industrial complex isn’t complaining however). Wait a minute though, have I missed something? I thought Libya was “liberated” in 2011 and the country is now a beacon of ‘freedom and democracy’ for the Middle East and North Africa? Are the Libyan people not enjoying being “free from a tyrant;” similar to the liberty the Syrian people will experience if Assad the ‘tyrant’ is overthrown and the country is handed over to al-Qaeda? Since the future belonged to the Libyan people in 2011, is the country not a vibrant and prosperous democracy today? Is Libya not one of the major hubs of the Mediterranean, with trade booming and flocks of tourists travelling from across the world to sample the delights of the country – from the fascinating culture of the indigenous people to the stunning (I must admit) Roman ruins? I thought the standard of living for the average Libyan was much higher than it was before the tyrant was deposed? Is Libya not helping to build the African continent up to try and alleviate the millions of people who live in poverty? I thought the “most successful” campaign in NATO’s history meant that terrorism could not gain a foothold in the country, considering the Western alliance spends the majority of its time (after antagonising Russia that is) talking about fighting terrorism? I thought NATO’s love-bombs only hit the baddies, and never killed or maimed any civilians?